Calendula – Calendula officinalis pH 5.3 this soothing, sweet and mildly floral hydrosol is antibacterial, anti-inflammatory, analgesic, anti-microbial. It’s excellent for skin issues such as dermatitis & eczema. It is beneficial for hypertension, and acts as an emmenagogue. Rose Geranium - Pelargonium capitatum pH 4.9-5.2 Rose Geranium hydrosol is hemostatic, anti-inflammatory & balancing. It has humectant properties, is great for rough/dry skin on elbows and heels. It is cooling to all heat conditions such as rosacea, broken capillaries, bug bites & sunburn. Frankincense - Frankincense carterii pH 4.7-4.9 Topically Frankincense hydrosol is wonderfully supportive of the skin. This hydrosol can be misted directly on the face daily and allowed to air dry to improve the texture of the skin. Lavender –Lavandula angustifolia 5.6-5.9 Ideal for every skin type, because of its balanced pH. It has a regenerative quality that is effective for damaged skin. It is great to combat a dry environment-mist on the face & neck throughout the day. Reduces inflammation after shaving. Calming to sunburn, bug bites, heat rash & itching. Use as a room spray to bring about a sense of calm. Refreshing & cleansing. Use on the abdomen for PMS and cramping. Helpful for hot flashes, especially when combined with peppermint, also great for headaches, stress & tension. German Chamomile - Matricaria recutita German chamomile hydrosol is very cooling and refreshing. 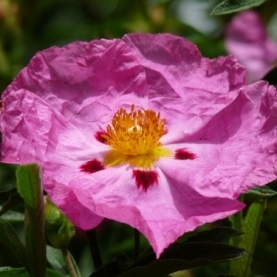 It is a wonderful anti-inflammatory, excellent for skin rashes and itches. Can be used as a compress for swollen, red, itchy eyes. And is an excellent skin toner. When not in use, store in a cool dark place. A refrigerator is great!